When praying for someone long-term, such as a family member, get into the habit of praying for small victories in the form of today's spiritual influence on them. This will prevent vain repetition, as well as get specific and will help you develop eyes to see the answers to these small victories. This was recently written by Josh Etter on the Desiring God blog here. When I first read it I thought this suggestion was REALLY helpful. I find praying for people/issues over the long term difficult. I don't think it's a matter of not trusting God to answer those prayers. It's just plain hard work, it becomes tedious at times and then it drops into the realm of the autopilot. This advice breathes new life into long haul prayers. Then as I reflected on the advice I began to wonder whether it was a case of modern management practices taking over the things of faith once again. You know...set a goal, break it down into its component parts, tackle it one small step at a time until the goal has been reached. This is a helpful model in so many settings. But is it relevant here - when praying for the big issues over a long period of time...for someone's salvation or for their ongoing health and wellbeing, for the life of one's church or for ongoing gospel opportunities within our communities? As a Christian I am exhorted to live one day at a time under God. Yes, I need to keep my eyes fixed on the end of the race. But for today I only need grace for today. And yes, I need to keep my unsaved friend or relative's long term need for a saving knowledge of Jesus in my prayers but they too need specific grace to see God at work in their lives in a way that is specific to today. So yes, I am very encouraged by this suggestion. And the added benefit of cultivating gratitude can only help to keep us spurred on in the hard but good work of praying over the long haul. Cathy recently wrote a brilliant post about pastoral care. Here is a large chunk of what she had to say. Pastoral care is rejoicing with the joyful and sharing the sorrow of the sad. It's about bearing each others' burdens, while maturing to bear our own. It's helping each other change, in these waiting days, into the likeness of Jesus. This doesn't only happen in a crisis. A lot of good pastoral care will be prevention (training in godliness), and fortifying each other for future suffering. A lot of hardship, grief and suffering outlasts a brief crisis. Real, long term relationships are what we need. So perhaps it is helpful to think about pastoral care as all the stuff we all do to help each other persevere and mature, in long term relationships. It's not only what leaders and paid staff of a church do for everyone else, in the crises. The end of pastoral care is the Day when we see Jesus. The goal of pastoral care is to have people get to that day, loving and trusting Jesus. It's about encouraging each other while it is still called Today, until that day, lest we drift in the meantime. It's not our job to rescue people and take the mess away (Jesus ultimately does that). Our job is to help them endure through it, leaning on Jesus. Part of that encouragement will be alleviating crises with meals, visits and some solutions. But our care for people in a crisis won't be particularly effective if there is no shared "family" life before and after the crisis. I really love the distinction Cathy has made between immediate crisis care and the long term pastoral care of helping one another to grow in our maturity in Christ so that we deal with our crises with increasing, God honouring maturity. I think I am less melodramatic and self-absorbed than I was, say, ten years ago, when a crisis comes upon me. And I hope and pray that in ten years time I can say the same thing, that I will be less melodramatic and self-absorbed than I am now. There will always be a place for sensitive practical help for those in tough times. I know I have been the recipient of many acts of kind and loving care. But we serve one another well by continually pointing each other to the bigger picture so that we might be better prepared for adversity and then face it when it comes in ways that glorify God. 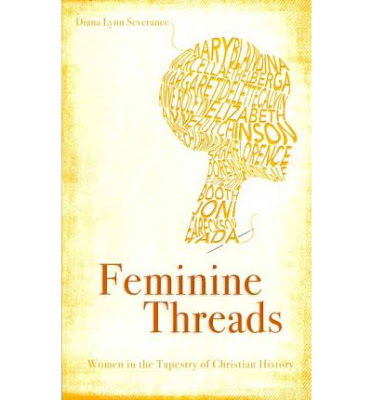 I finished reading Feminine Threads:Women in the Tapestry of Christian History by Diana Lynn Severance on Tuesday afternoon. On Tuesday evening I wrote a letter to Dr Severance to thank her for writing this outstanding book. Feminine Threads is a church history book. And there are lots of good reasons to read church history. If you are a church history novice then this would be a good place to start. It is a slim volume (just over 300 pages) and it provides a good survey of the history of the Christian church. There is enough detail to get a sense of the major events and flavours of the various periods of the church, starting with the New Testament era and finishing in current times. The book was published earlier this year so it's right up to date. What sets this church history survey apart is that it's told through the stories of the women of the times. Some of them are the mothers, sisters and wives of famous men in church history. Others are (or have become) famous in their own right - for reasons ranging from being born a queen through to the powerful testimony of lives well lived despite (or maybe because of) humble beginnings. Interestingly, as I turned the pages of this book I observed that many of the women's stories were quite similar. Don't think for a minute though that this book is repetitive and boring. What changes is the political, social, economic, theological, geographical and cultural landscape. And of course each story has its unique blend of personality, relationships and opportunities. But what is deeply comforting is the repetition of women responding to their enormously varied circumstances with godliness, faithfulness, abiding trust in and dependence upon Him and seeking to bring Him all honour and glory. It is this that makes Feminine Threads a profoundly encouraging book for women. I found myself convicted ever more deeply to be praying for those in my midst and I feel warmly encouraged to press on with the humble activities that fill my week, walking in the footsteps of those who have, by faith, gone before me. And what's in this book for men? The opportunity to more fully apprehend God's good plans for women as set out in the Bible and to see that in action time and again through history in order to encourage and build up the women in your own lives who are seeking to live in ways that please and honour God. And of course men and women alike get a good dose of church history along the way, which is always edifying. That is the final paragraph of Feminine Threads: Women in the Tapestry of Christian History by Diana Lynn Severance. It summarises the content and essence of this clearly, eloquently and beautifully written book. I can't commend it to you highly enough. Put it on your Christmas list. At the top. Eating...nothing. Dinner was not so long ago. And very nice it was. Pan fried salmon with vegies and in a rare moment for this household, a dessert of apple and apricot crumble. Drinking...a cup of tea. What else? Only the second for the day. This one is french earl grey. Remembering...a picnic with friends years ago at a botanic park nearby that showcases tulips at this time of the year. The brief for that picnic - we passed around a picnic recipe book and had to choose something from it as our contribution for lunch. I made a berry crumble. Ridiculous picnic food really. It was dubbed the Merry Berry Crumble. And thereafter I was dubbed Merry Berry for a while. That was a special day. I was remembering that picnic today because I took the boys to see the tulips this afternoon. And these days we only live 10 minutes away. About to start reading...Proverbs, the 60s Psalms and John. Almost finished Job and I think I understand it a little better than last year. Job truly fears the Lord - and the fear of the Lord is the beginning of wisdom. It seems important to bear this in mind in order to understand what is going on and explains in part why this book falls into the category of wisdom literature. However I have barely plumbed the depths of it. There is much more to understand. In other Bible reading news, I am happy to have caught up on the reading plan. I was well behind this time last month. Still reading......"Feminine Threads: Women in the Tapestry of Christian History" by Diana Lynn Severance. I have about 100 pages to go. It's fantastic. Stay tuned. Chuffed...to have collected £2.84 in commission from The Book Depository. Except they don't send the credit until it reaches £40 so this could take a little while! Thankful...for God's blessing of dear family and friends. We were well loved in all sorts of touching and practical ways and were prayed for abundantly during August. Thank you God. Thank you dear ones. Listening...to a bit of Bruckner. Mainly his 4th and 7th symphonies, after hearing the latter in a wonderful performance last weekend. I went with a dear friend who bought me a ticket (and one for herself) to the concert of my choice for my birthday way back in January. We had fantastic seats and it was really splendid. Nice to catch up with other friends unexpectedly during the interval as well. Excavating...the garden beds from the weeds! The photo shows last weekend's work, which filled the green wheelie bin. Blink and suddenly the garden is filled with weeds. How did that happen? It did cross my mind that I should have taken a "before" shot but then you can probably tell from the sidelines what it looked like before. I was so pleased to discover that the plants hadn't been choked to death were alive and well and that there were plenty of earthworms burrowing around. There are four agapanthus plants in amongst that lot. Given their good health I am hopeful of flowers this summer, which will be the first time in four attempts at four different houses to get an agapanthus to the stage of flowering. I know some of you out there think I have a green thumb. Don't be deceived! Needing...to get off the computer and finish preparing my Sunday School lesson for tomorrow evening. Copying...Rebecca again. The Status Report is a fun thing to do. Sadly there hasn't been much blogging between this status report and the last one. Not many original thoughts running around my head at the moment. But life is good.